Shoe enthusiasts have something to buzz about. Timberland has teamed up with music mogul Pharrell Williams to create a pair of boots inspired by nature—bees, to be exact. Composed of Bionic Canvas—a product derived by Bionic Yarn, Williams’s eco-textile firm, from a blend of organic cotton and recycled plastic bottles—the six-inch kicks feature photorealistic honeycomb cells on one iteration and blades of grass on the other. The limited edition has at least one celebrity fan: queen of the “Beyhive” herself, Beyoncé. The singer wears the boots in “Feeling Myself,” her latest music video with Nicki Minaj. Shoe enthusiasts have something to buzz about. 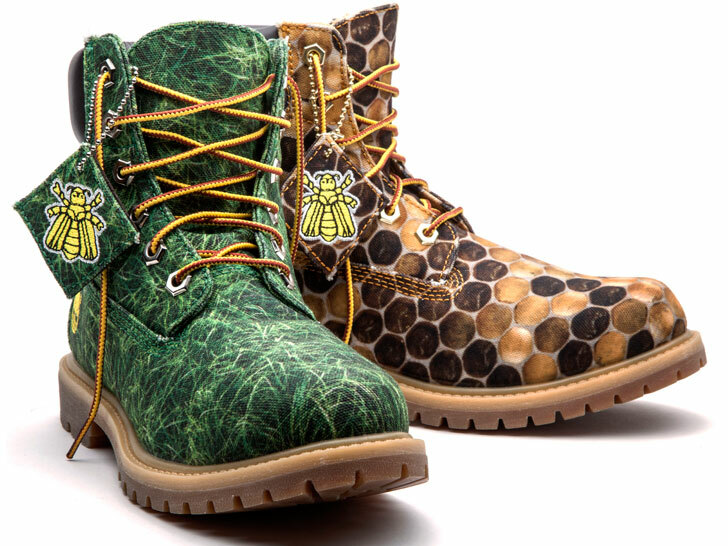 Timberland has teamed up with music mogul Pharrell Williams to create a pair of boots inspired by nature�bees, to be exact. Composed of Bionic Canvas�a product derived by Bionic Yarn, Williams's eco-textile firm, from a blend of organic cotton and recycled plastic bottles�the six-inch kicks feature photorealistic honeycomb cells on one iteration and blades of grass on the other. The limited edition has at least one celebrity fan: queen of the "Beyhive" herself, Beyonc�. The singer wears the boots in "Feeling Myself," her latest music video with Nicki Minaj.